On 18th Sept., Viet Nam – Germany Dialogue Forum was held in Hanoi which chaired by the Minister of Planning and Investment Bui Quang Vinh and Deputy Prime Minister - Minister of Economics and Technology of the Federal Republic of Germany Philipp Rosler. At the Forum, Deputy Minister of Construction Nguyen Tran Nam has signed a Memorandum of Understanding on Cooperation between the Ministry of Construction and Housing Loan Savings Bank of Schwabisch Hall (BSH). Accordingly, the two sides agreed to form the team of experts from the Ministry of Construction and a number of ministries and branches involved in Viet Nam together with BSH experts to study the housing loan savings model in order to create a solid legal framework for the establishment and effective operation and safety for savings banks for housing loans in Vietnam. Vietnam will create favorable conditions for BSH market research and contact with the commercial banks in Vietnam to come to a decision to invest in Viet Nam after evaluating the economic and legal basics. BSH will also provide international knowledge and necessary documents for housing loan savings for the team. Along with the signing ceremony, the Forum will have two sessions on the investment environment in Viet Nam - Germany and the innovative infrastructure development in which focuses on energy supply and food security. 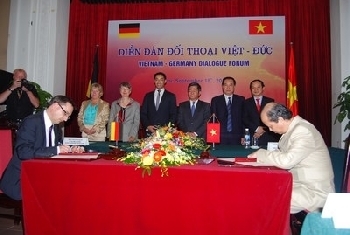 Since 1997, dialogue between Vietnam - Germany was held every two years. This was one of the important economic and political activities of the two countries. MM8 Truong Son St, Ward 15, Dist 10 10, HCMC.